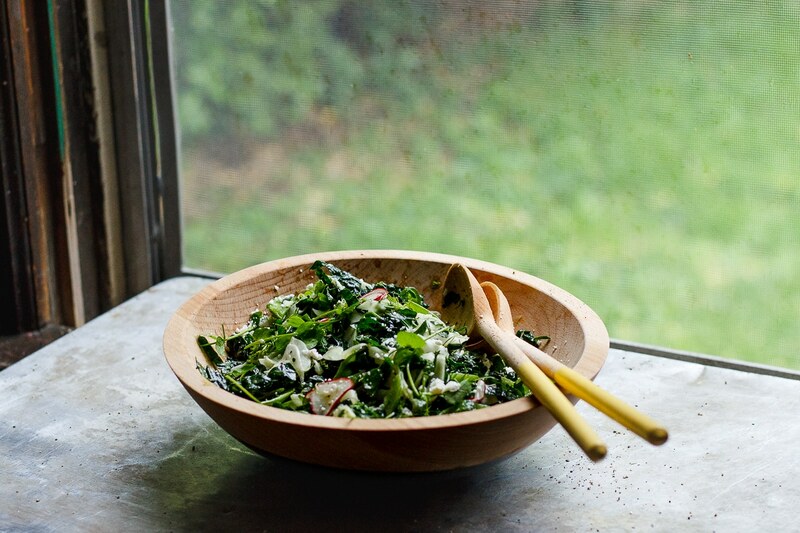 Lemony fennel, radish, spring pea and kale salad loaded with herbs and feta cheese. A bright, vibrant, packed with flavor spring and summer salad. 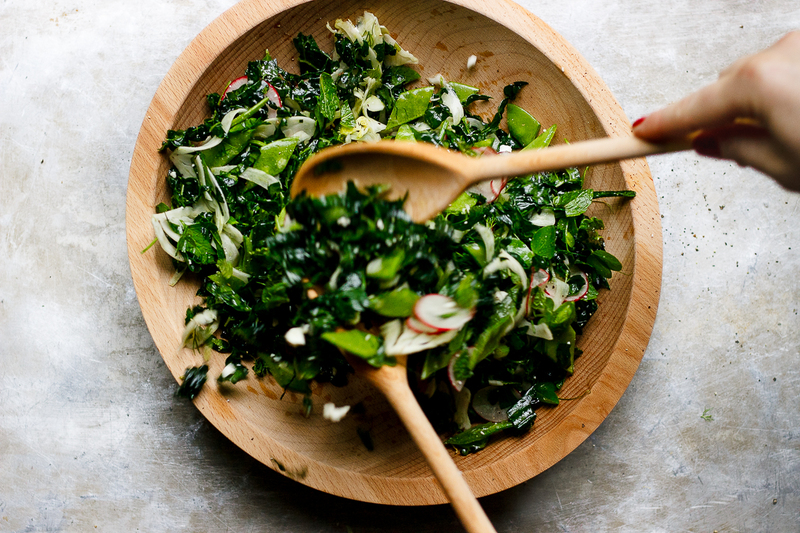 A bright, vibrant, lemony fennel and kale salad. The past almost two weeks have been a blur of layovers. Palm trees, cappuccino and pasta. My body, just the right kind of tired. And my heart fuller than full. I am blissfully unaware of the day of the week. I think it’s May now? I am nourished by family and good fortune. Full from the ocean and Emilia-Romagna cuisine. Drunk off jasmine-lined streets and amari-fueled Roman nights. I returned home just hours ago. Happy as can be and craving greens as deep as the bright blue sea. 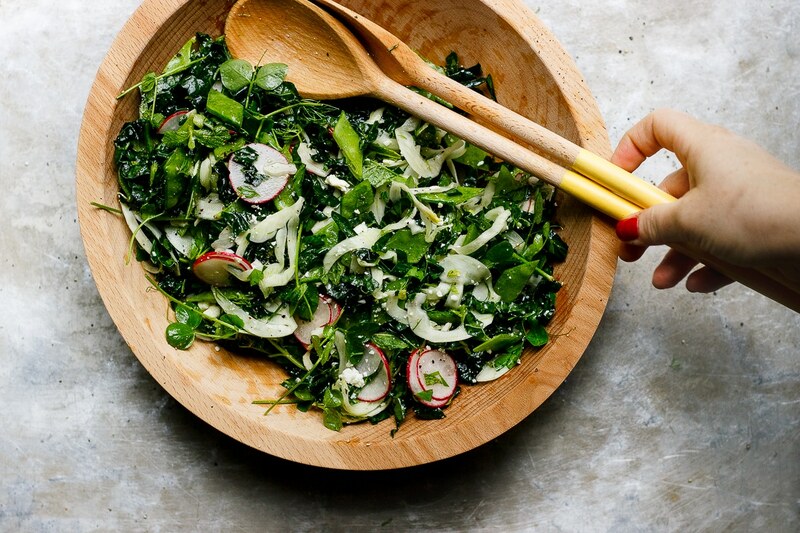 Specifically this herbaceous kale salad with lemony fennel, radishes, snap peas and feta from my dear friend Lily’s new book Kale & Caramel: Recipes for Body, Heart, and Table. I made this the night before I left, and took it with me to the airport the next morning. It was the best travel food. Crunchy and satisfying and nourishing. It gave me life and awakened my senses. And it is what I came home wanting. Lily’s book is neatly organized into twelve parts. Eight of which are dedicated to herbs, and four to flowers. This lemony fennel salad of course, came from the fennel section. Perhaps my favorite. Although it’s really hard to choose favorites. The beautifully bound pages are more than just a cookbook. It is an extension of Lily’s soul. Her words are intentional. Wildly creative, empathic, deeply healing – tangible. You can feel her spirit on every page. Kale & Caramel: Recipes for Body, Heart, and Table is now available for purchase anywhere books are sold. And to celebrate I’m giving away a copy to one of you! To enter tell me what your favorite herb is by leaving me a comment below. I’ll choose a winner at random on May 17 at noon Central, and notify the winner by email. Contest is open to readers in the United States. This recipe is exactly how it appears in [url href=”http://amzn.to/2qjpVZ3″ target=”_blank” rel=”nofollow”]Kale & Caramel: Recipes for Body, Heart, and Table[/url]. It holds up wonderfully and can be made ahead of time, lasting for up to 3 days in an airtight container in the refrigerator. Slice each sugar snap pea in half diagonally across its midsection to reveal some of the peas. Add the sliced peas, fennel and radishes to the bowl of massaged kale. Give the reserved fennel fronds, parsley and mint a rough chop, and add that to the bowl. Add the lemon juice, salt and pepper and toss vigorously to combine. Add the feta and toss gently to integrate. Taste and adjust with more salt or pepper if needed. Thanks to the folks at Atria Books for gifting me an advance copy of Kale & Caramel: Recipes for Body, Heart, and Table! Recipe copyrighted © 2017 by Lily Diamond, published by Atria Books, a division of Simon & Schuster, Inc.
Thyme – works in so many delicious savory dishes! Definitely basil! Everywhere, all the time. It has to be basil with oregano running a close second. This book looks amazing. I love cilantro. It’s always in my fridge. Rosemary is for sure my favorite herb! I can’t get enough. Parsley – a must in salads. I love all the herb so much, it is hard for me to choose. If I have to pick just one, it would be lavender. I love the color, the fragrance, and all the medicinal and other properties, plus it is beautiful. I love rosemary especially on roasted chicken with garlic! Cilantro. I love the way it smells up things. Do nettles count as an herb? That is what I am foraging for now and can’t read enough about! But basil is definitely my favorite summer herb. This salad looks so perfect. My favorite herb is lemon balm. Sherrie, oh Sherrie!!! I couldn’t be more honored to be your send-off to and welcome home from Italia. What an incredible adventure you had!! I cannot wait to hear more about it all. And I’m so incredibly honored to be on WF+L today, and in such stunning form. I’m obsessed with these photos—and that GIF!!! Omg. You are miraculous. Thank you. Thank you. I love you! And I can’t wait to see you…next week?!!? Definitely lavender, mint, and basil. All three herbs are complete game changers in any recipe and I love them so much! I love mint! it makes the best flavored water in the summer, but it also works well in savory and dishes. My favorites are a simple fruit salad or topping a spring inspired stir fry or salad with mint! I would have to say thyme with dill as a runner up! Cilantro is my favorite. It just pairs so well with everything. Chicken, fish, salads, dressing, sauces. Just love it! Cilantro! Oh and mint also!! Mint! I adore mint especially since I love to try my hand with Thai cuisine. Parsley is my favorite. It’s easy to grow, and so versatile. I sprinkle it on most meals to add a little brightness, and make it into pesto with whatever nuts I have on hand – which is decidedly good on salmon. Chives are my current favorite. Traditional herbs – I would have to say dill. I love dill. If ramps or garlic scapes count, those might top dill! I love mint! For drinking, for eating (savory and sweet). It’s so lovely, refreshing and versatile. I love basil. I can’t wait for tomatoes to show up at the farmers’ market so I can make caprese salads. Does lemongrass count? It’s bright, and so versatile (savory or sweet)! Basil and dill! Mixed together – yum. Lavender – I always have it in my aroma therapy oil diffuser! This salad is gorg! So happy for Lily! And I have to say, I’m still a sucker for basil. In any and everything. xoxo p.s. I loved seeing your Instagram stories from your trip! It looked legendary and wonderful. Oh my goodness, how can you pick just one?! I just had a baby so I’m getting back to summer cocktails and my favorite are rosemary cocktails! Rosemary is so universal! My favorite is for sure cilantro! It can be added to any Mexican dishes and then blended to make the most amazing chimichurri sauce that can be poured on anything – literally anything! Cilantro will always be my favorite. Basil for ever and ever. And you got to go to Italy for a few weeks – that’s a dream come true! I love so many, but cilantro is the one that I always have in the kitchen. How I wish Saffron would count as an herb, I love saffron! It’s so hard to pick one herb because I love using all of them, but if I were to pick one then it has to be garlic chives. Cilantro is my absolute favorite. I love having fresh cilantro for all the Mexican variety dishes I make salsa, tacos, salads and Mex-style roasted veggies. Honestly, this isn’t the easiest of questions, afterall it always depends on what you’re pairing the herbs with but I guess I can that parsley is definitely very high up on my list. I love rosemary. With roasted potatoes. I also love the cover of that cookbook. It would look pretty in a cookbook stand sitting on the counter. It sure would – isn’t it beautiful! Basil! Can’t get enough of it. Thanks for the giveaway! So hard to choose! But if I did it would be basil! Or rosemary, or mint. But probably basil. I love basil and mint. Yay! This salad looks phenomenal – always great to see fennel crunching it up. My favorite herb is the criminally underused dill, which I put in everything from egg salad to carrot soups. Thanks for the giveaway opportunity! Sherrie, your trip looked absolutely wonderful! Loved seeing all the Insta stories of all those late night drinks, pizzas, coffees, everything – ah, so great! Hope it’s not too tough adjusting to life back home. And this salad – yum. Sounds totally perfect for the current seasonal shift into spring. Beautiful salad! Frankincense is my favorite herb. Not a lot of people in the states. But it’s revered in other parts of the world. It’s an amazing essential oil that has outstanding benefits for the skin, helping with stress and nervous system. Not to mention controlling pain and inflammation. The possibilities are endless, really. I love using mint as an unexpected flavor in dishes. Great question! But hard answer – there are so many awesome herbs! I’ll have to go with fresh mint for several reasons – it can be used in tons of recipes, from sweet to savory, it’s easy to grow at home and it’s got great health benefits like supporting digestion, plus the smell alone can reduce anxiety. My favorite herb is determined by the season. Right now I can’t keep enough fresh mint in the house, but in colder months it’s sage I crave. My very favorite herb is basil. I’ve not had much luck growing it but I buy a pot of organic basil and can keep it going long enough to enjoy it for a month or two. Feta is mentioned on the last step but not listed on the ingredient list. What gives? Is this recipe supposed to have feta or what? Hi Kim – sorry about that oversight. It’s just a one woman show over here. Sometimes oversights slip through. There is feta in the salad and I’ve fixed the directions. Thanks for letting me know.